Now that I have your attention, here are the details on those items and more. We have a bunch of things going on in April, so we are getting the newsletter out earlier than usual! If we waited until our normal newsletter publish date, you’d miss the SPRING SALE and the second edition of our “Tea with Emily” Facebook Live. Is it safe to say this past winter wasn’t actually toooo bad? I mean, we have had worse… But we are definitely ready for SPRING! And with spring, comes our Annual BYL Spring Sale, which I know many of you have been waiting for! All of our digital products are now 20% off with the discount code “Spring19”. This code is good on all full year programs, unit studies and other PDF items from April 1st (no joke) through April 14th. 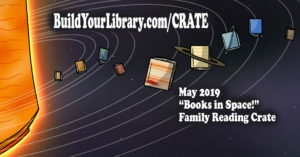 Any 2019 Family Reading Crates are not eligible for additional discounts at this time, but all remaining 2018 crates are already $25 without a sale code! This month’s subscription-style box offering is titled “Books in Space!” as a contrast to our crate a couple months back which was non-space related sci-fi. And yes, when ever you say the name of this crate you must inflect “Boooooks innnnn Spaaaaaaaaccce!” properly. As usual, we are including a picture book for younger children, a middle-grade family read aloud, a book for older readers, and a book for you, the parent! As you can probably guess by the theme, these books all have something to do with outer space! Every crate will include a booklet with discussion questions and rabbit trail ideas, as well as a link to a page on our site with additional links, booklists, movies and documentaries, and printable activities to go along with the books. We have been selling out of many of the last several crates, so don’t wait too long if you want this one. We’ll be packing and shipping the May 2019 boxes by the end of April, so order yours today! We do still have a couple of the April “Books at Sea” crates left so far. If you are on the fence ordering your first crate, you can check out unboxing videos for all previous 16 offerings to get a general idea on the crate page… but “Subscription Boxes are pretty much the only way you can buy yourself a gift and be surprised when you open the box!” so we don’t give out too many specific details ahead of time. All remaining 2018 crates are on sale for $25.00. It was great to see everyone at the VAHomeschoolers Conference! Thanks to everyone who swung by our booth to talk about BYL, FRCs and other homeschoolly things! But oh my goodness, the 13 hours in the car back and forth! 🙂 They already have the dates earmarked for next year, March 20-21, 2020, same place, same schedule. We have a much closer event scheduled in a couple weeks, only an hour drive for us. 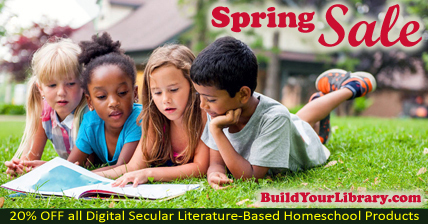 BYL will have a quick in and out appearance on April 16th from 3-6pm during the Voyagers’ Modern Homeschooling Conference in N. Chelmsford, MA for their Learning Resources Fair. Stop by if you are in the neighborhood! We will keep everyone updated if any more events are scheduled. We are actively looking into other potential appearances. We hope you all enjoyed our first “Tea with Emily” Facebook Live Stream this past February. If you missed our discussion on “Getting Started with Build Your Library,” you can find a recording on our Facebook page. Our second edition will be on April 5 at 1pm EST, where we will discuss “Reading Through History.” We will chat about historical fiction and well written history books and how to incorporate them into your homeschool. History never has to be boring! At the beginning of the livestream, I will give a brief overview of the topic and then open the floor to any questions you may have. If you have any questions you want to make sure we cover, you can submit them via our Contact Us page prior to the event, so we don’t miss it in the scroll. This is a Facebook Live event, so you will just need to click through on Facebook to watch it live. Every other month, I host a 30-60 minute Build Your Library homeschooling chat. You can ask questions about homeschooling, using Build Your Library curriculum, book recommendations, etc. We will announce the date ahead of time, and you will be able to submit some questions you would like to cover. You can also ask questions during the interactive live stream. Grab a mug of tea (or coffee) and cozy up with our virtual hangout! After this one, our next will be at the beginning of June. Are you looking for help or advice in your homeschooling journey? We have compiled all of our helpful resources into one blog post for you. From the many BYL related Facebook groups to my book A Literary Education, there is a treasure trove of information and helpful parents out there to help guide you along your homeschooling adventure. We always have our Social Media “chicklets” at the bottom of our newsletters and webpage, but we wanted to make sure you are following us on our other platforms. The Build Your Library Facebook is our go-to social media site, and we post there frequently with cool Amazon products and book recommendations we think you would like, as well as all of our Family Reading Crate announcements, blog posts, full year and unit study product releases and updates, and more. Although not 100% exclusively Build Your Library related, our Arrrgh Schooling YouTube channel has videos about books and homeschooling – but let’s be honest – it’s mostly books. If you want to see unboxing videos for the Family Reading Crates or just want ideas for books to read (either for you for your children) you are sure to find something useful! We also have a BYL Twitter feed where I share links and information about BYL and homeschooling. Or you can stay subscribed to our email list and browse our monthly newsletters.